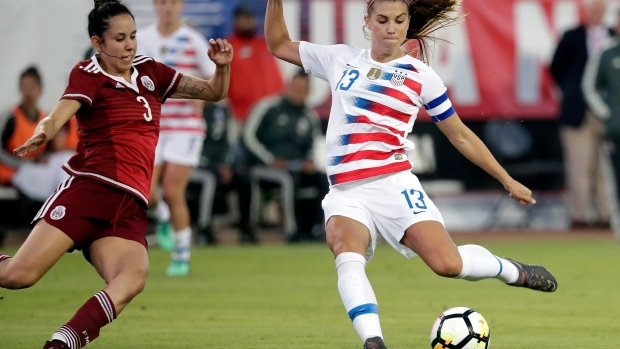 CHICAGO — Alex Morgan has been named U.S. Soccer's Player of the Year for a second time after leading the national team with 18 goals in 19 games and helping it earn a spot in the World Cup next year in France. Defender Tierna Davidson, who started in her first nine national team appearances, was named Young Player of the Year, U.S. Soccer announced Friday. The 19-year-old's college season at Stanford was cut short when she broke her ankle in September. Morgan scored seven of her goals during the CONCACAF World Cup qualifying tournament this fall to earn the Golden Boot. The U.S. won the tournament and earned a spot in the World Cup. Morgan also has three assists and has logged 1,500 minutes this year, most of any player on the team. Morgan also earned Player of the Year honours in 2012, when she had 28 goals and helped the national team win an Olympic title. The U.S. women's team, ranked No. 1 in the world, went undefeated in 2018 with 19 wins and two ties. That extended the team's overall unbeaten streak to 28 games, dating to a 1-0 loss to Australia in the 2017 Tournament of Nations. The draw for the World Cup is set for Saturday in Paris. The United States is the defending champion, having won in Canada in 2015. Morgan currently sits at 98 career international goals. "To be named captain with Megan (Rapinoe) and Carli (Lloyd), I felt I was challenged to succeed in a really positive way and was comfortable growing into this larger role with the team," Morgan said in a statement. "I'm also pleased that I was able to improve and evolve in my play along the way. There's a good energy to the team right now and we're all really looking forward to getting started next year." The other nominees for women's player of the year included Julie Ertz, Tobin Heath, Lindsey Horan and Rapinoe. The voting panel includes the national team coaches, players who have made at least one appearance with the team this year, members of the U.S. Soccer Board of Directors, members of the media and other select panelists.